So, I’m a bit of a Thoroughbred pedigree nerd. River is the third OTTB I’ve had and I love researching their lineage and learning their similarities and differences. River is a grandson of Mineshaft (one of my own personal favorite racehorses), who is a son of A.P. Indy, grandson of Mr. Prospector and Seattle Slew and great-grandson of Secretariat. He also has Mr. Prospector and Secretariat on his dam’s side, in addition to Storm Cat (a grandson of Northern Dancer). Now, I truly don’t know how any of those lines translate to producing a sport horse once they have retired from racing, but It’s pretty undeniable that they are strong genetics either way. I wish I had a gorgeous confirmation shot of River on a beautiful Kentucky lawn, but I still think the similarities are striking. As I said, I don’t have enough information to know how this breeding will translate to a career as a show horse, but I do think it’s fun information to have! You might be wondering how I picked River. I have had the opportunity to work with all manner of horses throughout my riding career, but this was the first time I’d gone about purchasing a young horse for myself. Houdini was a surprise pony, and when you add in the fact that I was ten and that he is not a Thoroughbred, there aren’t a lot of similarities between the two. Maria is an OTTB, but she was a polo pony before being sent to my trainer to be sold into her third career. Brandon was also an OTTB, but he was well into his career as an event horse (after having done a stint as a show jumper, as well) by the time I took over the ride on him. They were all older than River at the time that I got them as well, he’s a late baby so he’ll be turning four next month. When I started out horse shopping, I didn’t really have a lot of criteria or requirements of what I wanted. I wasn’t picky about color, mare or gelding was fine, somewhere between the ages of 3 and 5, ideally an OTTB but I was open to anything that was within my budget. The only things that I was adamant about were relating to the size. I’m only 5’3” and I don’t have long legs, so I can ride a smaller horse, but I wasn’t looking for anything under about 15.2hh. I’m also only 5’3” without long legs, so I didn’t want anything over 17hh either. The other most important thing to me was to find a horse who was compact through their body, a little bit short coupled (having a shorter back). Other than that, I was open to anything with good legs and a good brain, as long as the price was right! I looked at a lot of ads through CANTER Texas, as well as other sites and Facebook pages. I did look at a few TB/Warmblood crosses, who were all very nice, but tended to be priced above what I wanted to spend. My preference was to stay close to home, with my logic being that the less I had to spend on travel/transportation to see the horse and get it home, the more horse I could buy. In November of 2018, I was at a clinic and mentioned to a trainer, who I’ve known for many years, that I was looking into getting a young horse. 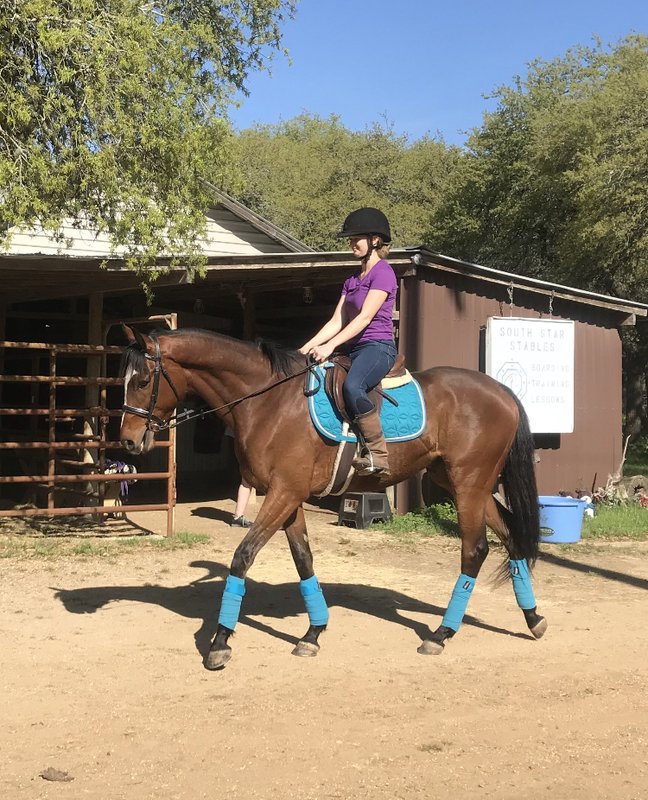 She mentioned that she and one of her clients had just gotten a young OTTB in October, who they were planning to work with and probably sell sometime in the next year. At that point, I wasn’t seriously looking yet, so I didn’t think too much of it. Unrelatedly, the same trainer had recently taken in a feral cat and her kittens, re-homed the kittens, spayed the female cat, and was looking for a new home for her, as she already had several barn cats. I’d noticed an issue with some mice who enjoyed cleaning up the crumbs left behind in Maria’s stall and had decided that a barn cat was the best option, as opposed to traps or poison. We got in touch to coordinate moving the female cat to my house, and she mentioned that she thought the OTTB they had might be a good match for me. She sent me a photo (actually, the photo above of him in the arena, wearing the surcingle) and I was immediately interested. I mean, look at him! Her barn is actually just down the road from my house, I couldn’t have shopped any closer to home if I’d tried. This was the absolute ideal scenario, as I was able to go ride him and spend time with him on the ground multiple times before making my decision. The selling points on River ended up being his size, 16.1hh currently, but will probably grow a bit more; his confirmation, quite short through his back with very straight, clean legs; his personality, a total cuddler, kind of in your pocket and very affectionate; and his brain, he asks questions, which I like, particularly for an event horse, because I think of it as an indication that he can keep himself out of trouble, he also doesn’t have big reactions, when he’s unsure of something, he stops, looks and thinks, and moves on. All that said, he is just 3. He’s still got growing to do, and pretty much everything is still new to him at this point. I’m sure there will be many updates along the way, but I’m so excited to be getting started with such a sweet and willing young horse, and I think he’s the perfect addition to my little herd!